I had this annoying problem where only some of the folders in windows (7) would show the thumbnail, which was present as a “folder.jpg” file inside it. 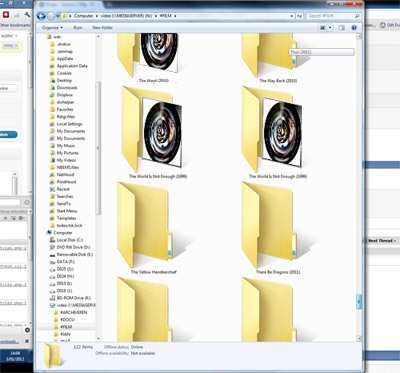 Most of the folders would just show the default folder-icon. Nothing I did would change this, except when I would navigate into the folder and back, the thumbnail would suddenly appear. This would typically happen on mapped network drives or network shares. I could narrow the problem down to the way windows uses cashing of thumbnails. As of windows vista, thumbnails are stored in cashing files that are stored in the users application data folder: C:\Users\**username**\AppData\Local\Microsoft\Windows\Explorer . These files are protected however, and can’t be deleted. 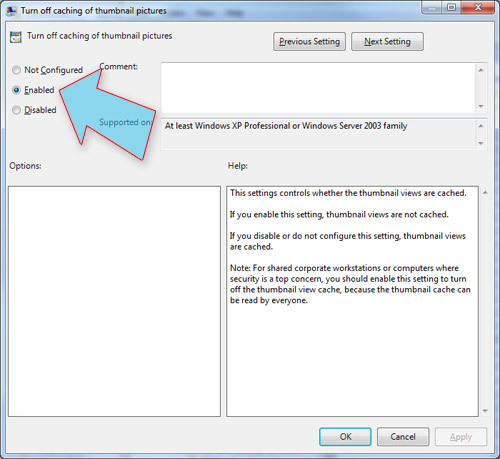 Cleaning the thumbnails can be done by the “disc cleanup” tool, located in Accesoires -> System Tools. Whenever I cleaned like that, all thumbnails would disappear and leave a blank spot. Not even the default folder icon would return. I could, however, remedy this by killing and restarting explorer in the task manager. (or simply by rebooting). But the missing thumbnails would still be missing!! Solution: My solution my be harsh, but effective: Disable the cash completely. Find “Turn off caching of thumbnail pictured” and double click it. Choose “Enabled” from the three radio buttons and confirm with OK.
Now restart explorer (by killing it in task manager. 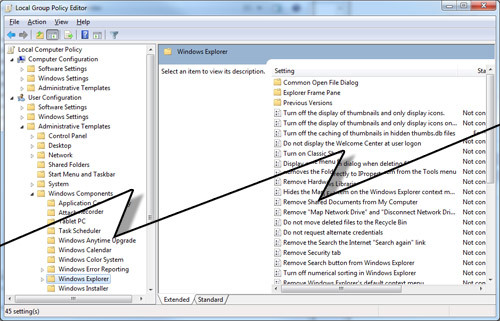 Restarting explorer using the “New Task…” button in Applications where you type “Explorer”). OR simply reboot windows. Now all thumbnails will be loaded every time you open the folder. This may be a bit slow, but at least you’ll have the thumbnails.